God gave these words to Aaron, the priest, and his sons to use in blessing the children of Israel. As I read this passage a few weeks ago, I thought how appropriate it would be as a blessing for our family. I was excited to find these verses as a print on Etsy. I found an inexpensive mat and frame at Target and my husband hung it on the wall in our living area. Beyond that, I want to make this an ongoing tradition in our family. For years, when my mom mailed me a card or a letter, she would include the words of 3 John 4, ” I have no greater joy than to hear that my children walk in truth.” I want to do the same with this blessing for our children. Numbers 6:27 says, “And they shall put my name upon the children of Israel; and I will bless them.” It’s exactly what I want for our family – God’s blessings! With this print on the wall, we can now see God’s words of blessing every day. 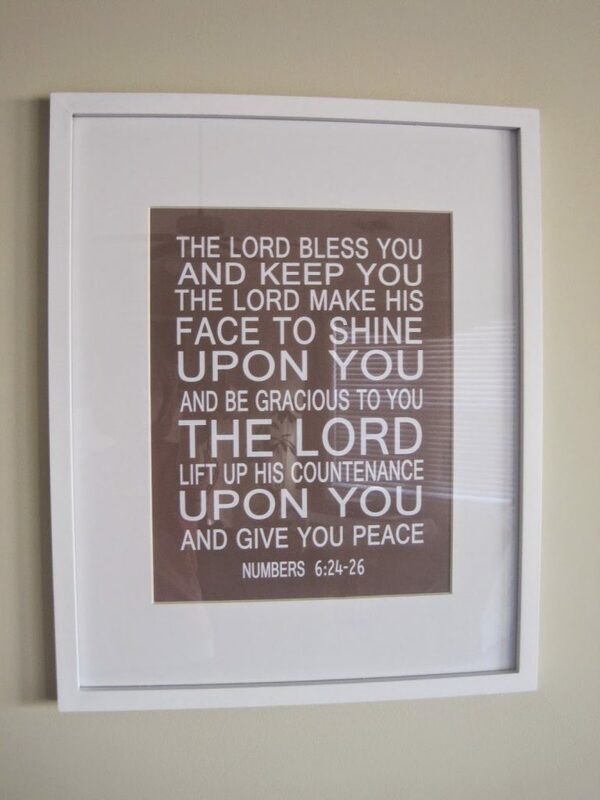 Do you have any Scripture posted around your home? You know, I don't have any Scripture on my walls, but I think this is an excellent idea! I'm going to have to get some! When it's on your walls, you can't help but memorize it! True! Hoping that I'll continue to focus on the words and not just walk by as I get used to them being on the wall. I can't believe I really don't have any actually up, either. Lots of cards & books around, but not hanging in a frame. And I looooooove the verse your mom always shared, too!